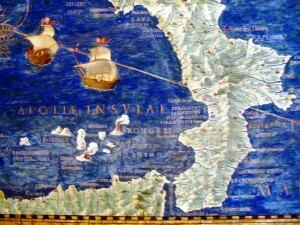 A 16th century map in the Vatican shows the southern peninsula of Calabria. Monterosso Calabro is in the hills of Calabria between two seas…the Mediterranean (specifically the Tyrrhenian Sea in the Mediterranean) and the Ionian. 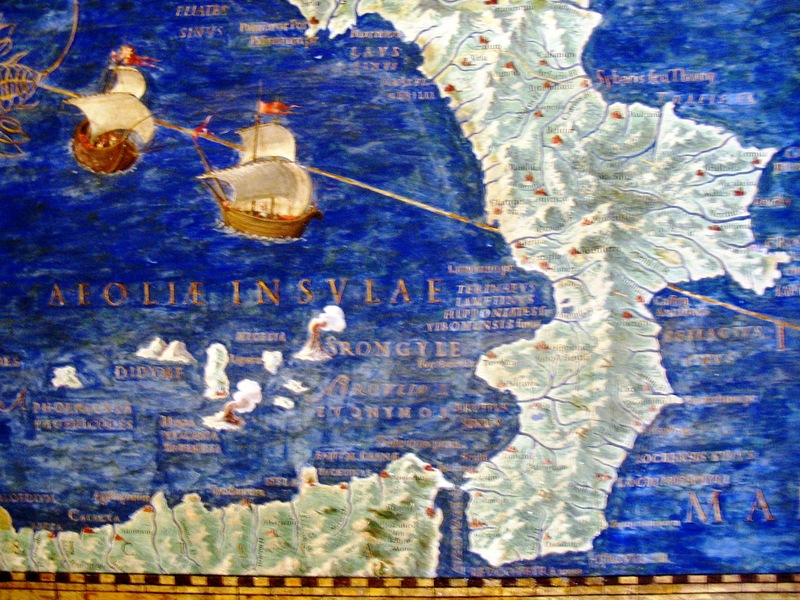 Even in ancient times, this part of Italy was a strategic location, being the narrowest part of southern Italy’s boot connecting both these seas. Greeks, Romans, Byzantines, Saracens (Moors), Normans, Aragonese, Bourbons, and Napoleon’s Frenchmen all lived and walked these hills. Pythagoras, Hannibal, and King Richard the Lionheart all found this land – and perhaps the area around Monterosso itself – hospitable. Monterosso probably dates to Byzantine times, c.700 or 800 AD. Its streets wind tightly around a Norman lookout tower – whose foundations, archaeologists think, may be Byzantine too – and tumble down a steep hill past the town’s original defensive walls, down to olive and orange groves, orchards and fields. Visitors to Monterosso today find the local population quite friendly, if a bit curious about you first, and nearly anyone there can offer ideas on what to do while in the area. 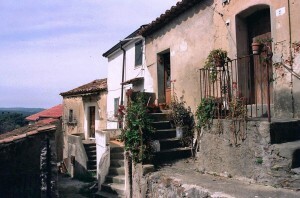 The small houses in the Borgo section of Monterosso. The older sections of Monterosso all have their own local names. The Capana section is that area around the old watchtower (because it once had the town clock mounted to it, locals still call it the clock tower). Below Capana is the Basolato region, so-named because the streets were made of basalt. Monterosso’s Town Hall is located in this section. The Borgo section of town is below this; still chock-a-block with the old houses that once belonged to the peasant workers who labored for the great landowners. 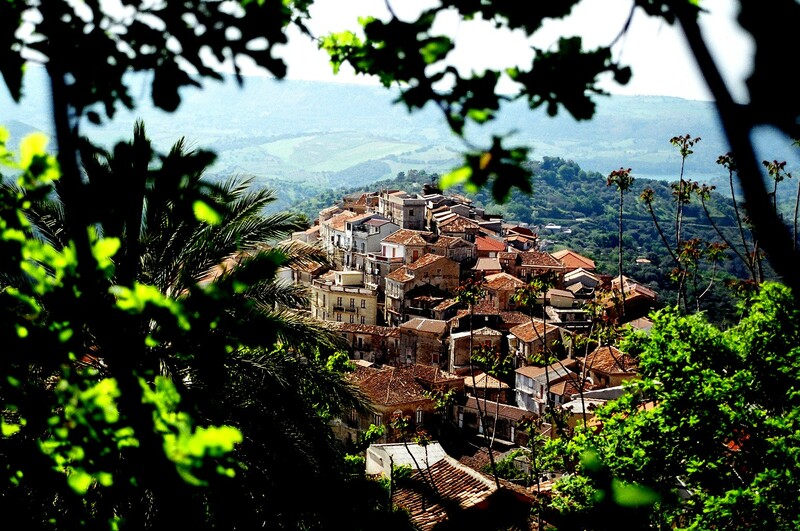 On the east side of town, climbing steeply uphill, is the Monastero region of town, named for the old monastery whose ruins can still be seen high above town. If there was ever a feast of ancient architecture virtually unchanged since at least the 14th century, the historic center of Monterosso is it. Start in the Capana region (near the old clock tower). Even today, it is difficult to discern the historical origins of this area, which, as it is yet “undiscovered” nor highly “studied,” makes it all the more interesting. “Modern” 16th, 17th and 18th century palazzi have of course inserted themselves, but this only makes the feast all the more sumptuous. Start at the old Norman lookout tower (known to the locals as the “clock” tower) and work your way down. Any local who pokes his or her head out to wonder at your curiosity will tell what they know, and if your Italian isn’t up to par, no worry. A sweeping arm and a simple “La storia è molto interessante!” (The history is very interesting!) will be enough. Antonio Parisi can be hired as a guide, or can recommend others if he is unavailable. 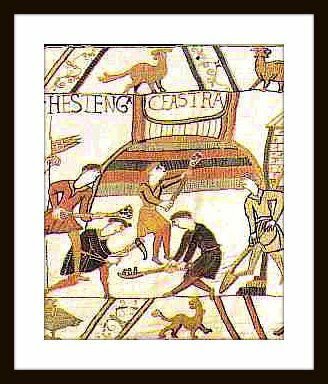 A scene in the Bayeux Tapestry shows Norman knights building one of the many watchtowers (motte and bailey) they constructed throughout the lands they conquered. 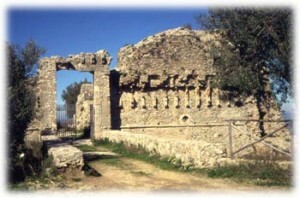 The old Norman tower is the highest structure in the Capana area, although it looks quite small to us today. Early in the 11th century, adventurers from Normandy (Normans) set out for southern Italy and Sicily, and became masters of simple yet enormously effective fortifications. These were topped by towers for lookout purposes, and surrounded by a palisade – which would become the city’s walls. They were known as a motte and bailey. Monterosso was no different. Monterosso Calabro's own watchtower, perched in the highest spot of the oldest section of town. Strategically located, and situated in the narrowest part of Calabria with clear views to the south and out across the Mediterranean to the west, Monterosso’s tower today is the descendant of hundreds that were built for defense in the Calabrian hills along the Mediterranean and Ionian coasts in the 12th century. These towers can still be seen today all along the western coastline of Italy, and are illustrated on the old maps. 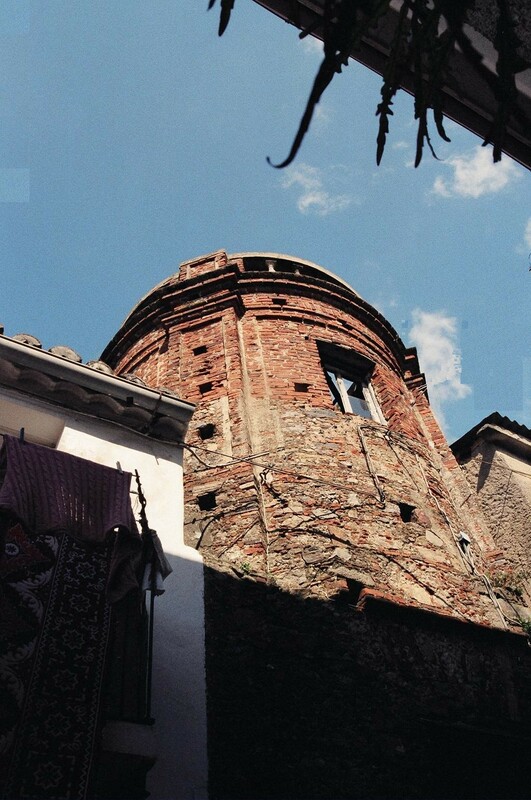 Although first documentary evidence tells us the Normans built Monterosso’s tower, the Byzantines were probably actually the first to do so, as they were already firmly established in Calabria when the Normans arrived. 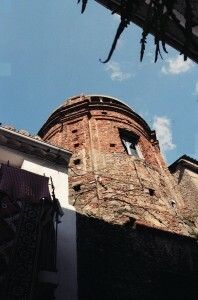 The upper part of Monterosso’s tower collapsed in 1905 following an earthquake, but according to architectural historians, there may remain a trace of an original Byzantine tower in the foundations of the current tower. The Tower today is being restored with private funding from visitors and the few expatriate homeowners in Monterosso – mostly Americans. 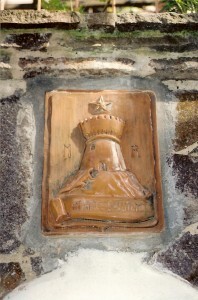 Contributors to the restoration will have their names inscribed on the brass plaque that will be placed on the tower. If interested, contact the Pro Loco Association, through the Contact Page on this website. As for the town walls, these were crumbling in the mid-19th century and not much remains of these defensive walls today. Continue your walk south around the corner from the Tower, past Palazzo Massara on your right, make a sharp right and continue down to the Museum on the left. Museo della Contadina e Artigiana seen on right on a sunny morning on via Marconi. The Museo della Civiltà Contadina e Artigiana della Calabria, in the 17th century Palazzo Aceti-Amaroso just around the corner from Monterosso’s main church of Maria del Soccorso, has won state awards for being one of the best of its kind in southern Italy. It displays original costumes of the region and is filled with the traditional artifacts and implements that have sustained Monterosso through the centuries – the spindles and looms, the farming implements, the woodworking tools, an iron forge, etc. The room to the left of the main hall is the Palazzo’s original olive oil keeping room, with an original wooden olive oil press, and huge terracotta oil vessels. It even has a hole in the floor which opens onto a buried olive oil jug, to catch any oil that spills! It is open, and free, for much of the year. If closed when you arrive, ask at the town hall for Antonella. Monterosso's new multimedia museum, La Filanda. Monterosso’s newest museum, La Filanda – Museo Multimedialle delle Serre, is in the old silk weavers’ workhouse, behind Palazzo Massara (silk weaving became an industry in southern Italy in the 14th century, when – legend tells us – monks brought silkworms back from China hidden in their staffs). It is called “La Filanda” (the mill) because it became an olive oil mill in mid-century. The museum today is a multimedia feast of the geography, traditions, folklore, costumes, gastronomy, and history of the area, complete with interactive touch-screens. Local architect Dr. Rosario Chimirri conceived and designed the museum, www.youtube.com/user/cgeppo2 and is happy to show visitors around if he is available. 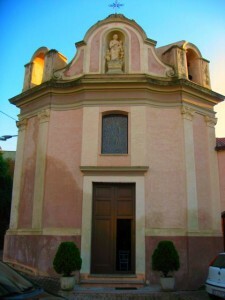 Monterosso's main church, Santa Maria del Soccorso on the main square. 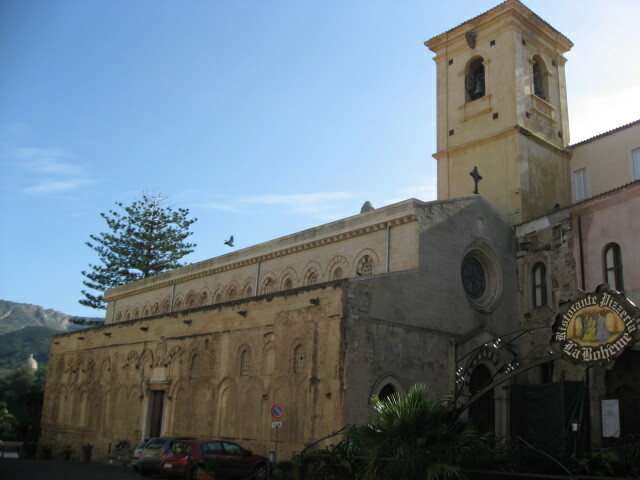 The Church of Maria del Soccorso in the main piazza dates from the 18th century, but its bell tower, with its massive base, dates to the 15th century. It is generally open all day, with Catholic Masses held daily. 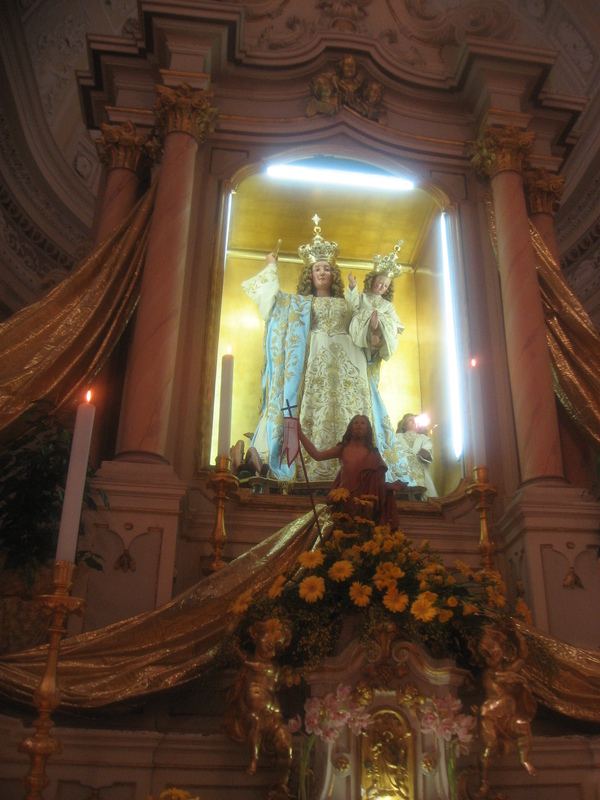 Madonna above the altar in Santa Maria del Soccorso. Frequent town events are also held here, as are concerts, for its acoustics are very good. Private tours of the Church can be arranged ahead of time, or any local will be happy to show you through it. A legend in town involves the beautiful gessoed Madonna above the altar, and how she saved Monterosso during one of the many battles fought around Monterosso over the centuries. The Town emblem showing the tower, a star, and a lizard, made in terracotta and mounted about the town fountain. The doorway of Palazzo Morano, built in the 12th century, but now mostly abandoned. Rooms in parts of the palazzo are now private residences. A few yards down from Pasquale’s shop you will find the original entrance behind an iron gate to Palazzo Morano, dating to the 12th century. Like many of the old palazzi, this one, too, passed from father to son over generations, and these sons subdivided and built walls to establish separate residences. Nothing of the original grandeur remains of Palazzo Morano, but the iron cross mounted on a column just near the entrance carries its own quaint legend about princes and peasants. Back up the street past the Museum is Monterosso’s City Hall, a modern building from the 1960s. 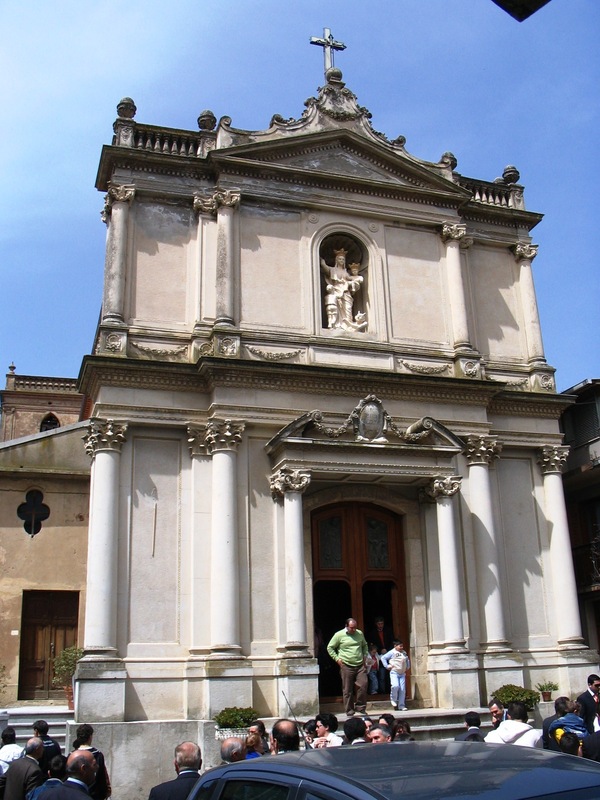 It was built on the site of another of Monterosso’s churches, which fell victim to the 1783 earthquake and eventually had to be torn down. The original Church held the chapel of the Massara family containing the statue of St. Francis – riddled with brigante bullets of the outlaw and bandit Vizzaro (Francesco Moscato). That same statue is now in the foyer of Palazzo Massara, also quite near the Tower. The City Hall is the scene of many town functions, but it is an ugly building, one which many Monterossini hope will itself fall down. There is a piazza outside the door of the City Hall, which hosts band concerts and other functions throughout the year. Monterosso’s town band frequently practices here. From the balcony here, one looks down on the Borgo section of Monterosso, also one of the oldest areas. The houses here are low and small, many sporting the malocchio “evil eye” masks popular in ancient construction for warding off evil spirits. It is in this region of town that the local peasants would have built their homes, overlooking the fields and vineyards in which they toiled. To the left of the oldest palazzo in town, Palazzo Basile, seen in the foreground, is the Borgo section of Monterosso. 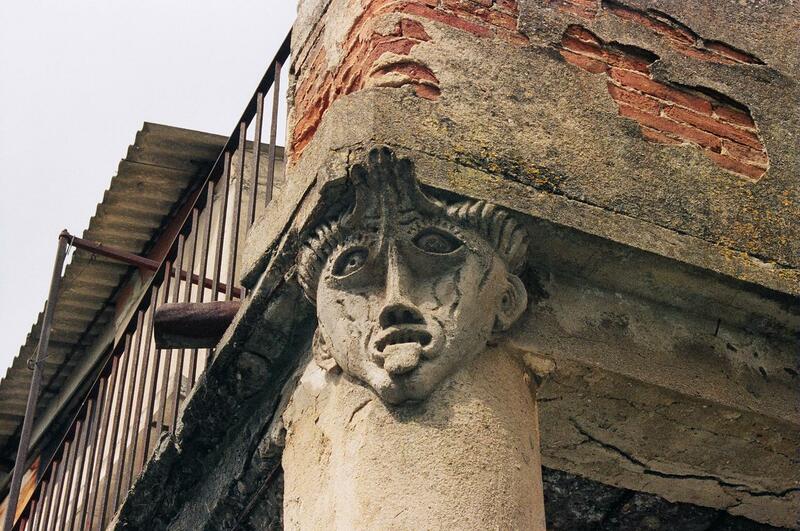 Found there is this particularly outstanding malocchio, or “evil eye.” Above Palazzo Basile is the Capana section of town. The large building seen on the far left is the new City Hall. 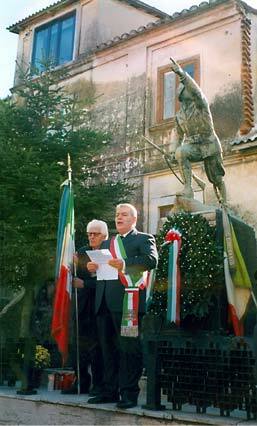 On Armistice Day, the Mayor of Monterosso holds a ceremony at the town's memorial statue to those who fought in the War. Back up to the Tower, and now winding eastward down the stone streets you will pass the Church of Our Lady of the Rosary in the small Piazza del Popolo (look for the marble plaque listing the Monterosso boys and men lost in the First World War). This is a tiny Church, but worth a visit if open. 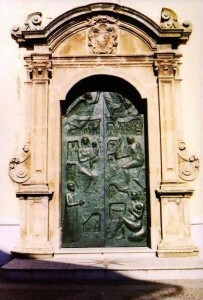 The bronze doors were made by local artist and sculptor, Maestro Giuseppe (Pino) Farina. Down at the bottom of the hill, take a left and then a right past the wonderful bronze of the charging infantryman – another memorial to the Wars. You are now approaching the main commercial street in town. The bank will be across the street (money machine always open), and fruit, vegetable and meat markets are all available here, as are pastry shops, bars, a pizzeria/pub (see Restaurants) and a few mercantile stores. The local gelateria is a bit further on, just before the grammar school. Ruins of the 11th century Camaldolesi Monastery - a Benedictine order founded by St. Benedict in the 6th century - above Monterosso. Above the main commercial street in town is the “new” town, in the area called “Monastero” built perhaps in the 14th century. It is just below the ruined arch of the old Camaldolesi Monastery, a Benedictine monastic order founded by St. Benedict of Nursia in the sixth century, and established in Italy through the efforts of the Italian monk Saint Romuald at the start of the 11th century. The view from the Monastero section, on the way up to the ruins of the monastery, are spectacular. All that remains of the Monastery now is a stone archway, reachable by a steep climb up ancient stepped streets, but oh! What a view from here! Definitely worth the climb. A hint to finding it is the reconstructed lion-mounted gate and steps on the main commercial street in town. Taking the air in on the stoop in twilight, Monterossini women do their crocheting and knitting. A walk (actually a “climb”) in this section, past a few major palazzi, such as Palazzo La Grotteria, are a jumble of old homes that look out over the older sections of town, the valley to the west, and the blue Mediterranean between a break in the ridge. Walk through this area and in the late afternoons you will find old women on their doorsteps crocheting or knitting, old men taking the sun, and children all around them. The small church of Our Lady of the Carmel is also located here. Along the roofline of the building just behind this Church is a medieval bread oven, with a carved underside between ancient wooden beamed struts. All three of Monterosso’s churches are always open – the single local priest going from one to the other each day to say Mass. A drive on the roads surrounding Monterosso often reveal surprises. 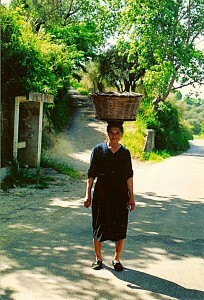 This woman emerged from the countryside with a basket of porcini mushrooms on her head. On another day, an old couple with a heavily laden donkey appeared. In evening, wild boar are seen. This is Italy as it was a century ago. The bronze doors of the main church in Capistrano were made by Monterosso's Maestro Pino Farina, who is famous throughout southern Italy for his bronzes. Outside the oldest parts of town, several local roads will take you out of town and into the countryside. Watch the traffic on these country roads as twisting turns are frequent. 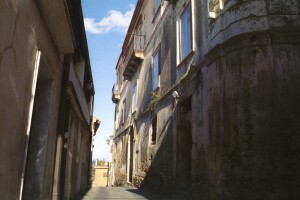 The area has many interesting destinations: In Polia is the 17th century Palazzo Amoroso, by the main church. Filadelphia, (renamed from Castelmonardo for our own “city of brotherly love” after a devastating earthquake destroyed most of the town in the 18th century) was the site of the battle of Castelmonardo in the 16th century between the French and the foot soldiers of the conquering Spanish Aragonese. In the main church in the nearby town of Capistrano, is a fresco reputedly painted by Renoir when he came to paint here. To the south, quaint Capistrano holds a rumor that Renoir came to visit and paint one year. 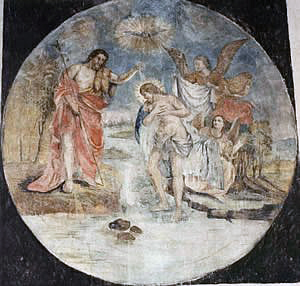 On the back wall of the Church is a fresco reputedly painted by the famous French Impressionist during a stay there. Locals are proud to point it out. Meanwhile, the fine bronze doors of the church were crafted by the Monterosso’s own Maestro Giuseppe (Pino) Farina. 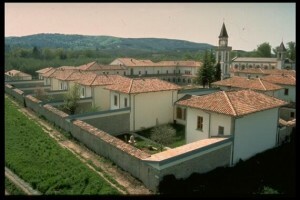 Still active, the 11th century Carthusian monastery at nearby Serra San Bruno is open to the public. Even farther south is Serra San Bruno, in a green valley on the Ionian side of the Serre Mountain range. This monastery was founded at the end of the 11th century around the Priory of St. Bruno and where Carthusian monks still live. The Priory library and museum are open to the public. The town is still a destination for pilgrims, and the countryside around is famous for its tall pines and wildflowers. In town, there is a fine Baroque church, and some beautiful palaces to see with fine stone work surrounding the portals. 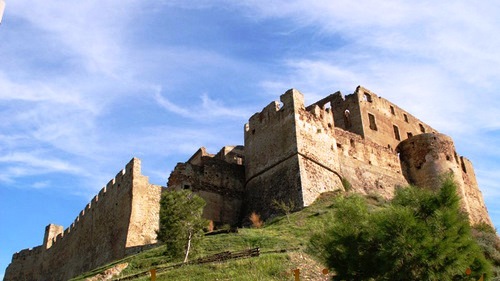 Nearby, in Arena are the ruins of one of Frederick II’s many fortress-like castles, built throughout his “Kingdom of the Two Sicilies.” The ruins are open to visitors and there are stunning views from them. High in the mountains south of Monterosso is Arena. It, too, has the ruins of another of Frederick II’s many fortress-like castles. Frederick II, who had so much influence throughout Calabria and Sicily, is shown here with one of his beloved falcons, in an old manuscript illustration. Pizzo is a short drive down the mountain from Monterosso, full of lively shops in its historic center, as well as a small castle above the shore, dating in its current form to the 15th century Aragonese. Pizzo, Vibo Valentia, and Tropea are the main destinations south along the coast, packed full of excellent seafood restaurants and ice cream shops. 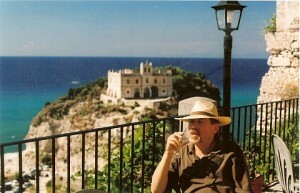 The trip down the mountain from Monterosso is a leisurely 20 or 30 minutes, and another 10 minutes into Pizzo. Pizzo is a small but lively town with many quaint shops off its main square, a weekly outdoor market, and a stunning position above the beach. It is most famous for its small castle, dating from at least the 12th century, but in its present form mostly 15th century Aragonese (think Henry VIII’s first wife, Catherine of Aragon). It was here that Napoleon’s brother-in-law, Joachim Murat, was ordered executed after a failed attempt to take over the area. That scene is reenacted in full costume by Pizzo residents each year. Pizzo is perhaps even better known for its tartuffo, a large portion of ice cream stuffed with melted chocolate! Vibo Valentia can actually be seen to the south from Monterosso, if you count being able to see the profile of Frederick II’s huge castle on the ridge above the city itself. VV, as it is seen on addresses and autos registered in this part of Calabria, is the seat of this region In Italy. It was settled by the Greeks, and then by the Romans who named it Vibo Valentia. After the fall of the western Roman empire in 476 AD it was for a period a strategically important fortress under Byzantine rule. 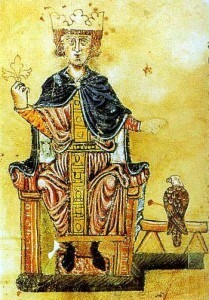 It was attacked and destroyed by the Moors in 850 and again in 983 AD, then a second glorious period began under the Normans, who in 1235, changed the town’s name to Monteleone. 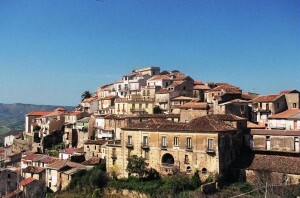 In the following centuries it was a renowned cultural center, and in 1799 Gioacchino Murat appointed it as capital of the province of Calabria Ultra. 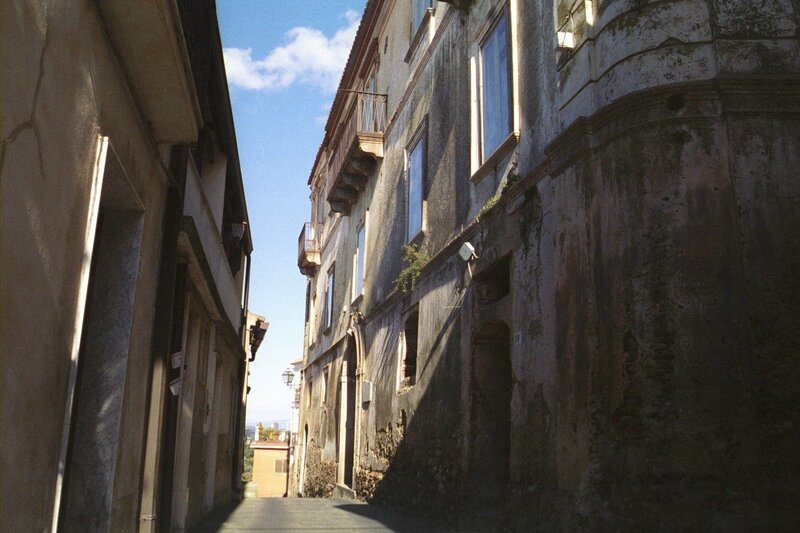 In 1928 the name was changed back to Vibo Valentia, and in 1992 it became the capital of the newly established province, created with part of the territory of the province of Catanzaro. 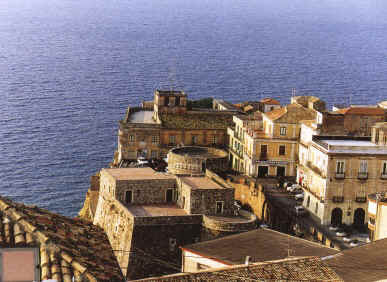 High above the busy metropolis of Vibo Valentia, the seat of government for the region, is the largest of Frederick II's castles in this area. 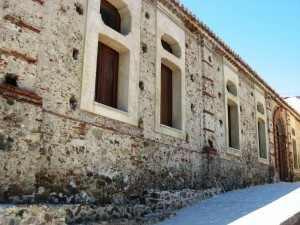 It is now a museum, mainly of the Greek artifacts constantly found in this area of Calabria. Seen here is a jumble of terracotta votive heads, placed as offerings in the ancient Greek temples and homes. 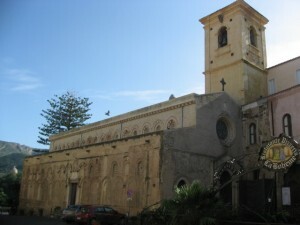 The ancient Norman church in Tropea boasts early Romanesque banding. Inside are the beautiful marble tombs of two Renaissance youth, as well as an early Byzantine Madonna painting. 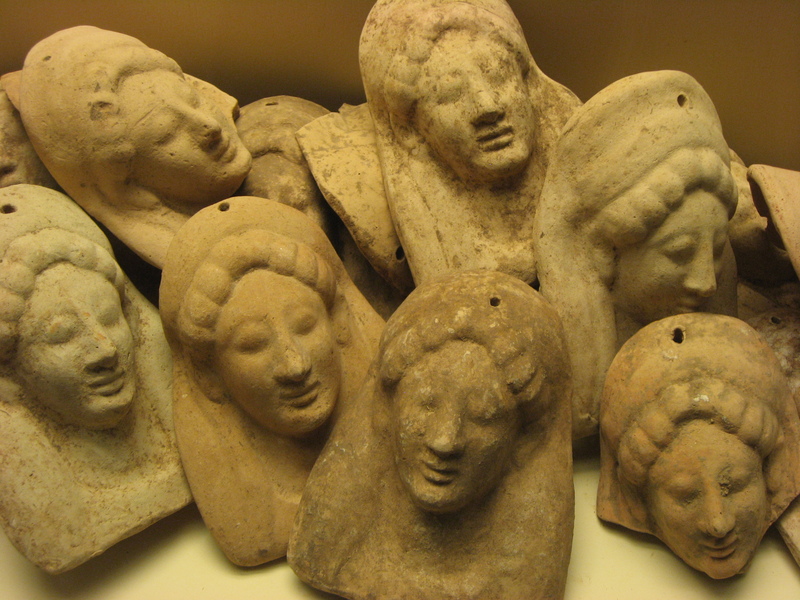 absolute must-see exhibit of the many Greek artifacts found and uncovered in this area: the Greek bronze helmets, and the huge collection of terra-cotta female heads – household votive offerings to their protective goddesses. Filled with shopping, old palazzos, and plenty of restaurants, this one overlooks the island where Santa Maria dell 'Isola stands looking out to sea. Tropea is a jewel of a resort beach town along the south coast towards Capo Vaticano. This stretch of coastline on the Tyrrhenian Sea is called the Costa degli Dei, the ‘coast of the gods’, and it is stunning. Tropea is filled with golden palazzos (some crumbling elegantly), many shops, restaurants, and markets, and boasts magnificent views out to sea of Stromboli volcano and several other Aeolian Islands. Tropea is a lovely resort beach town down along the coast south. The large rock outcrop jutting into the sea from the center of town was once a monastery, Santa Maria dell’Isola. 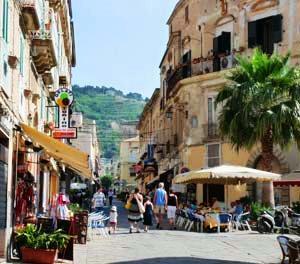 Tropea is a maze of pretty streets and little hidden squares where you’ll usually find restaurant tables. The heart of town is up on the headland and if you explore the streets you’ll find traces of the old town wall and fortifications which defended the landward side. Tropea is quite famous for its red onions grown in the area. In Italy these onions are so famous that cipolla di Tropea (“Tropea’s onion”) has become an Italian synonym for all red onions. One of the gelaterias in town even makes a red onion ice cream (as well as others based on squid ink and nduja, the local spicy salami). Worth a visit while in Tropea, is to the Norman Church, or Duomo, where the original multicolored banding of stonework can still be seen. Inside the stark interior are the marble tombs of a 15th century young girl and boy in renaissance dress, as well as two unexploded bombs from World War II. What to do while visiting Monterosso when you’re tired of history and touring??? EAT! 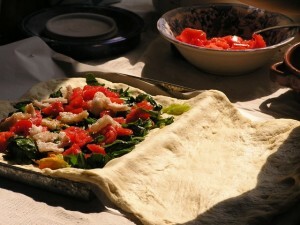 The food in the Monterosso region of Calabria is earthy and hearty, and the wine full-bodied. 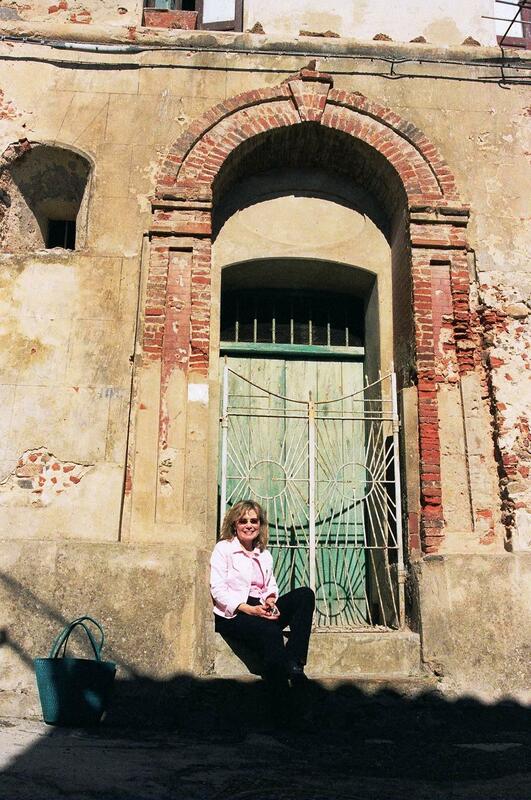 If you cannot find a Monterosso wine to purchase, ask any of the locals, or a local shop-keeper. Many families will sell privately. When you're tired of touring, come back to Monterosso. There's always more food waiting! 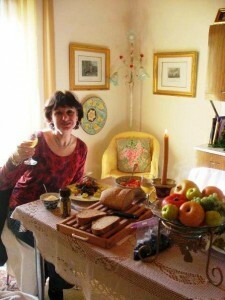 If you are lucky enough to be invited to dine in someone’s home, wonderful! But if not, or if time is short, see the Food & Dining on this website. Remember that porcini mushrooms are a local specialty (as are the local ovuli and chiodini mushrooms), picked by Monterosso residents (including the children, all of whom have their state licenses to do so) in the forests around town. Chestnut flour pasta stuffed with wild boar’s meat and those same mushrooms, is also an ancient specialty. The sea is a mere 20 minutes down the mountain, so all seafood is fresh, and the local tuna sauces and sardine torte, with their Byzantine and Saracen origins, are fantastico. 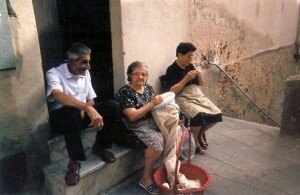 There are several gastronomical feasts held in town throughout the year, including the Basolata Festival, held in that part of town (near City Hall) in mid-August, when the local housewives bring out their best on tables lined up in the narrow streets, amid fireworks once the summer night falls. If olive oil is a particular interest (and it should be), know that local Antonio Parisi’s oil has won best of the region in recent years, and he is happy to show you his olive oil operation at Villa Velia B&B, revived from the ancient ways, and explain the local history and process in detail – not to mention give you samples! E-mail Antonio through the Contacts link on this website, or ask for him when in town. Local cooking lessons can also be arranged. 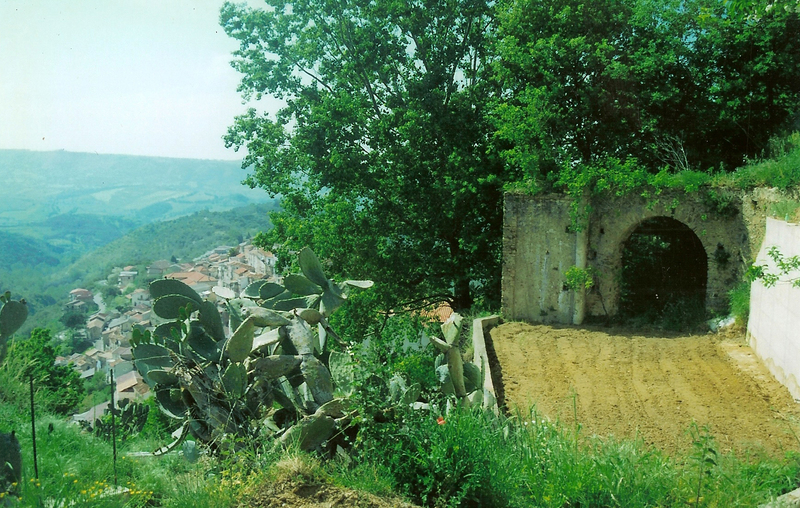 Check ahead of time with Antonio, or with any of the local Agriturismo B&Bs.